Recipe by Simon Hopkinson. Ideal for a barbecue. Put the chicken breasts in a shallow dish with the juice of a lemon, 4 tbs of olive oil, salt and pepper, and a few sprigs of thyme. Set aside. Skin the peppers by charring them under the grill (or over a naked flame if you really are having a barbecue). When they are black all over put them in a covered bowl until they are cool enough to handle, then peel the skins off. Make the aioli: in a mortar, crush the garlic thoroughly with some salt, then whisk in the egg yolks. Add the oil in a thin stream, whisking all the time and interspersing it with an occasional squirt of lemon juice to taste, until the aioli is thick and pale yellow. Season with pepper to taste, and set aside. Slice all the vegetables into a bowl (deseed the peppers first; don’t discard their juice, add it to the bowl). Douse the vegetables in olive oil, season with salt and pepper, and mix it in with your hands so everything is coated. For the cooking, you need either a barbecue or one of those ridged cast iron pans. 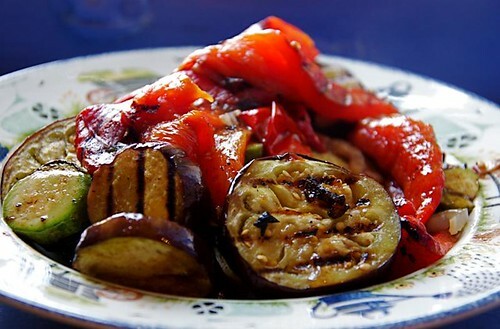 Get it nice and hot, and start by grilling the vegetables in batches. The fennel will take longest, and the peppers hardly any time at all; everything needs to end up with charred stripes on it. As they are done, put them in a large shallow bowl (preferably white) and cover with foil. When the vegetables are done, put in the chicken skin side down and grill for a few minutes, then turn 45 degrees and cook a bit longer, so it has criss-cross stripes on it. Turn over and cook for another few minutes until springy to the touch. Put on top of the vegetables, cover, and leave for another five minutes; it will cook a little bit more in its own steam. Serve in the dish, with lemon wedges scattered about and bread and aioli on the side (and some chilled rose wine of course). This recipe is based on one from Roast Chicken and Other Stories by Simon Hopkinson and Lindsey Bareham.